Scope has always been a leader within the disability sector – whether it was to provide integrated education or fight for the NDIS in 2011. We have always aimed to be on the front foot, adapting to our customers’ need. This year, we decided to take this a step further with a centralised, customer-focused Customer Enquiry Service (CES). A unique service within the disability sector, we launched CES with the view to make the enquiry process smooth. We learnt from customer service in other industries and talked to customers to find out about their experience. Armed with this research, we created a ‘one-stop-shop’ solution for you. The CES team has quick access to the right information and connects you directly to the right person at Scope. “We all know the pain of calling a call centre only to have to repeat our story to various people! 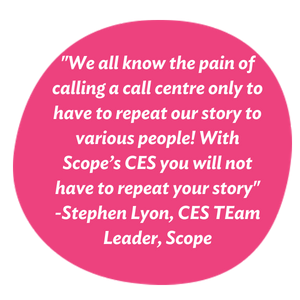 With Scope’s Customer Enquiry Service you will not have to repeat your story,” says CES team leader Stephen Lyon. coordinator, the CES team will help you with the best options available. 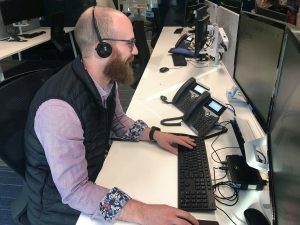 “With the NDIS providing more choice and control, it encourages people to find different service providers, engage with them, and choose from a variety of service providers,” adds Stephen.